Last week I told you I was taking the day off and going on a tour of the Capitol with my parents. I’ve been before but my parents hadn’t so I scheduled a tour on one of my days off. It’s such a beautiful building and to see parts of American history are kind of cool to me. So I thought since it was a sweltering hot day and I was playing a tourist I should snap a couple of shots of what my casual travel wear is like and how I accessorize for the day. First when it’s hot I want to wear something simple and light. The Gap has a few of these really simple but pretty pleated skirts that have a paper bag waist tie and pockets! What girl doesn’t love pockets on a skirt or dress? I grabbed mine on a 40% off sale so in store I paid less than $15 for it – a good bargain. The version of the skirt I have is navy blue with green, white and hot pink graphics on it, so I paired it with a simple white tee from Target (I own multiples of this shirt). 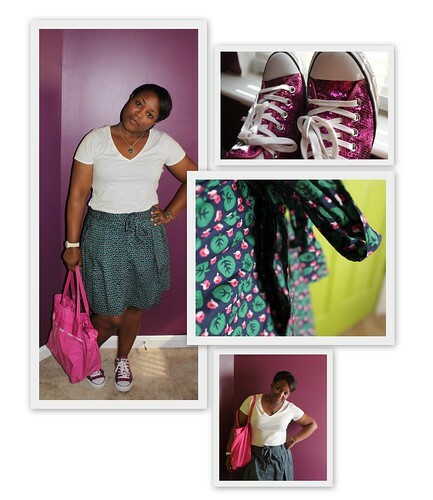 For a bit more fun and interest I added my Passion Fruit Pink EveryGirl Tote from LeSportsac (courtesy of LeSportsac) and my magenta sequin Converse Chuck Taylors because sequins make anything better. Seriously. I kept my jewelry pretty simple (since I had on sequins and all) with a Malachite heart shaped pendant and bracelet. I love green, so any chance to add more of it and I’m all over that. So this is my casual tourist style. What do you like to wear when you’re a tourist? Cute look!! When I’m a tourist, I like to blend in as much as possible so I dress like I normally do (very cute, lol) and I skip the whole camera worn around my neck and carrying/constantly referring to a map standard tourist behavior. In Chicago, tourists drive us crazy and they are so obvious with it. .-= Kim´s last blog ..My Latest Forever 21 Haul =-.